“I’m SAAAD!” ClaraJane comes in my bedroom this morning as I’m pulling on boots. “I put bandaids in my …backpack?” she says to her reflection in the mirror, gulping breaths. “And now they’re GO-OOONE!” she sobs, con waterworks. Calming down, she gravely nods yes in the mirror. She laughs. I laugh. We laugh together. Then she whacks me. “You made me LAUGH,” she protests, storming out. Woe unto the mother who helps her daughter resolve her pity party… TOO SOON. 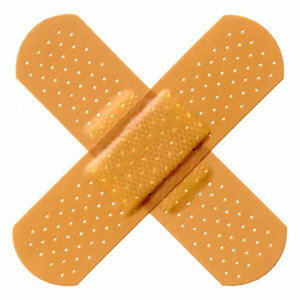 And that reminds me… I better go get more bandaids. I don’t want to find out what happens should the bandaids actually be GONE. This entry was posted in family, forgiveness, Friendship, health, love, mental health, music, nature, parenthood, patience and tagged band aid, bandaids, Blue Eyes, Blue Eyes Crying in the Rain, boo boo, boo hoo, ClaraJane, crying, crying in the mirror, laugh, missing bandaids, Pity Party, Willie Nelson, you made me laugh. Bookmark the permalink. I just got the demo of the pencil case with band aids in it and — lo! — the need for a band aid had arisen at school this morning so I heard all about that too.